A Union soldier stands at rest with his musket barrel resting on the ground. He stands atop a square column with reliefs of a cannon, a seal, anchors, and swords. 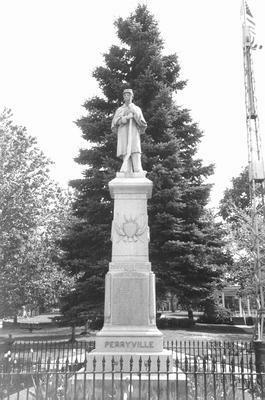 : “Civil War Monument; Willoughby, OH,” Ohio Outdoor Sculpture Inventory, accessed April 22, 2019, http://oosi.sculpturecenter.org/items/show/845.